The digital tachometer is a gauge for determining speed, velocity and distance. 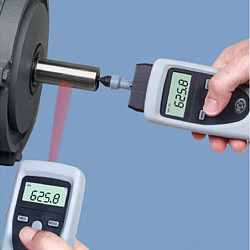 This handheld tachometer measures in two ways: either optically and therefore without contact, or mechanically via various adapters. In the optical measurement, a focused light beam is directed onto the object and reflected back by a thin, reflective foil glued on the object with the frequency of rotation. The result is displayed on the 5-digit LCD. 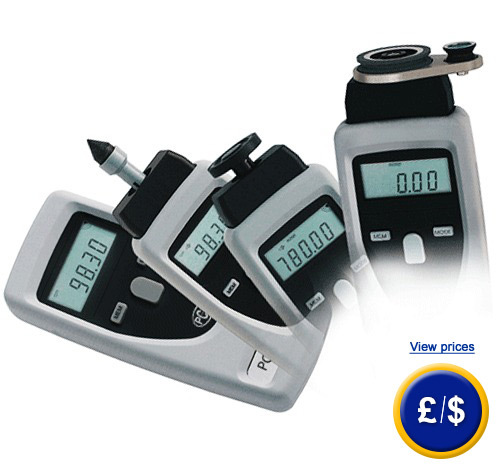 The distance between the digital tachometer and the measured object can reach up to 600 mm. The mechanical measurement of speed is performed with an adapter tip that is placed on the axis of the moving parts. For normal speed or length measurement, a measuring wheel is placed on the adapter. A special adapter allows it to compete with the digital tachometer speeds and lengths of yarn, or wire (glass) fibers. The digital tachometer is delivered with a protective cover and a sturdy carrying case with accessories. It also comes with a factory calibration certificate, allowing you to use the digital tachometer as calibrator. Extensive instructions are also included. The digital tachometer is very useful for installing machinery and equipment and for maintenance work, testing or work in the development lab. You can measure rpm of engines, turbines, pumps, mixers, centrifuges or transportation facilities, as well as lengths of wire, layers or strip lengths. Here, is a similar model, but it additionally provides an RS-232 and software to transfer data to a PC or laptop: PCE-151 tachometer. At this link you will find a wide selection of hand tachometers. And here you will find a tachometer with similar characteristics, but with touch sensors included in the delivery. ±0.02 % (or ±1 ) of r.p.m. 1 x digital tachometer PCE-DT 100, 10 x reflective strips, 1 x cover, 1 x tip measurement, 1 x hollow tip, 1 x wheel adapter (0.1 m and 6 "), 1 x special mechanical adapter for threads, fibers (glass fiber) and wire extension of wave, 2 x 1.5 V batteries AA, 1 x carrying case, 1 x factory calibration certificate, 1 x user manual. 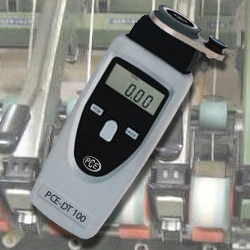 The PCE-DT 100 digital tachometer is equipped with a special adapter for threads, fibers (glass fiber) and wires. The speed of the knitting machine should be checked with a handheld meter. When making measurements with the digital tachometer, you should be careful not to tear the wires or cause any other fault. The digital tachometer is equipped with a special adapter for wires. This can measure the length and speed. Due to the special adapter for wireless, there is almost no measurement error of traction on the web (< 3g). The digital tachometer can also be used in knitting and tights machines. In the production of electric engines, it is necessary to protocol the rotations when working with a certain current in the final control. For this purpose a tachometer is needed, which measures the speed and stores measurements quickly and accurately. With the digital tachometer, the rotations of an engine are measured through a mechanical adapter and a tip, and the values are stored in memory. Then, the value is recalled and the value is written down in the protocol with the input current. Another possibility offered by the digital tachometer is the rotation detection without contact with the aid of reflective bands.